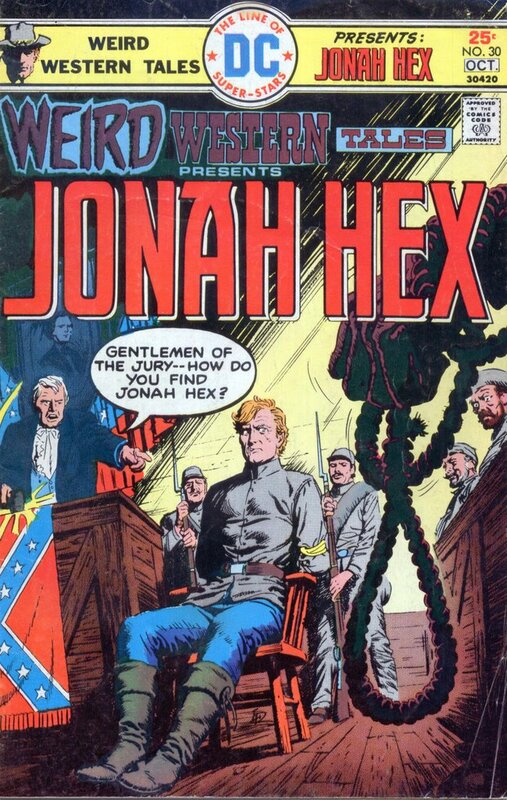 WWT 30 is another pivot point in the Jonah Hex saga. First off, this was the month that DC started with a new format for its covers, trying to have a branded banner running across the top of the book. Back in the 70s, comics were sold in spinner racks and kids would just flip through the tops. Having this banner was a good idea in that it was easier & faster to find a DC book. It was a bad idea for a book like Weird Western Tales in that 40% of the cover was taken up with the title and the banner. Next, this book continues with the aftermath of the Fort Charlotte massacre and has Jonah confront Turnbull for the first (& last?) time. Third, it starts the domino effect of bad or incorrect dates/timeline for Jonah. But enough of all that, let's get into the book. The story starts in 1875 in Richmond, Virginia as Jonah rides into town, thinking that he needs to square things between himself and Quentin Turnbull. Jonah stops in a tavern and asks for whiskey. As he stands at the bar drinking a man at a nearby table shouts that he doesn't want to be in the same establishment with a Yankee turncoat. He continues ranting about how Jonah caused the death of many of his friends and he wants to have revenge on Jonah. The man's friend convinces him to leave the bar and eventually everyone leaves, including the owner. As the owner walks out the door, he tells Jonah that the whiskey is free but just bust the glass when he is done because the owner doesn't want real people to catch what Jonah has. Jonah broods for several minutes and finally shatters the mirror behind the bar with a well placed whiskey bottle. Out at the Turnbull plantation, Solomon informs Turnbull that Jonah is in town and that "aftuh all the trials an' tribulations you done been through" Turnbull will get his revenge. Turnbull plans to get some men armed with shotguns but then gets a better idea, inspired by what Solomon said. Later that night, as Jonah is resting outside his hotel, he is approached by a local lawman who informs Jonah that there is a matter of settlement for the broken mirror in the bar. As Jonah reaches in his pocket to pay for the damages, he is knocked out from behind. The "lawman" and the attacker bind him and haul him to a undisclosed barn. When Jonah wakes up, he finds himself tied to a chair and in the middle of a 'courtroom' that has Quentin Turnbull as the judge and survivors of the Fort Charlotte massacre as the jury and witnesses. Jonah is being charged with treason against the Confederate States of America for betrayal of his comrades in January of 1863 (1). Man after man testifies about what they saw in Fort Charlotte and then they pronounce him guilty as charged. Turnbull decrees that Jonah will have the buttons of his coat removed as a sign of disgrace, he will have a yellow stripe painted down his back as a sign of betrayal, and he will be shot at dawn by a firing squad. Turnbull then orders Jonah taken away because "the very sight of him makes me want to vomit". Jonah is lead away and as he is locked in a toolshed one of the guards kicks him in the stomach and throws Jonah inside. In the toolshed, Jonah finds a pitchfork and manages to use the pitchfork to cut the rope holding his hands. He then lures the guard to the window in the door, grabbing the man by the throat and threatening to kill him unless he opens the door. The guard opens the door and Jonah slams the door into the guard, knocking him out. Jonah reaches to get the guards gun but just then Solomon arrives with a shotgun. As Solomon holds Jonah at gunpoint, Solomon says how much he regrets doing this. Jonah maintains his innocence but Turnbull arrives and takes the shotgun from Solomon. Turnbull states that he is going to kill Jonah himself, but Solomon tries to reason with Turnbull about Jonah's innocence. As Turnbull gets ready to shoot, Jonah turns and grabs the pitchfork and uses it to deflect the shotgun. He then knocks the shotgun from Turnbull's hands. Turnbull states that Jonah should kill him now or else he will kill Jonah. Jonah wants to talk to Turnbull and he tosses the pitchfork aside. Turnbull rushes Jonah and as Jonah sidesteps out of the way, Turnbull trips and falls on the pitchfork. The last scene is of Jonah riding off as Solomon holds the dead body of Turnbull. Men killed by Jonah - none, not one. Jonah's injuries - Knocked out once and gut kicked once. 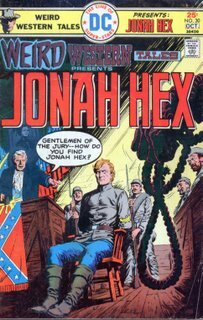 Timeline - (1) When this was published, the timeline wasn't a problem, but in 1980 Jonah Hex #37 had Jonah meeting Stonewall Jackson and ultimately shooting him. Stonewall was shot by his own troops in May of 1863. But in this issue, Turnbull states that the massacre happened in January 1863, 4 months prior to Jacksons death. Overall, this story wasn't as great as the previous one. The stabbing of Turnbull was overly melodramatic and this story seemed a poor resolution to the Fort Charlotte Massacre/Turnbull revenge subplots. Next Week: Jonah Hex vs. Wolverine!! !